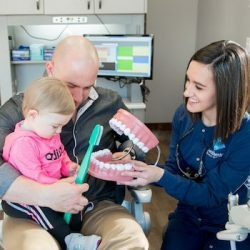 As a children’s dental office, we strive to meet the unique needs of children. We are committed to family-centered adolescent dental care for infants, children, kids, adolescents and special needs patients in the Spokane area. It is important for us to establish a good relationship with both patients and parents. We especially want our young patients to feel comfortable with our doctors and staff in our office setting. Early regular visits to the children’s dentist will build a trust that will help young children prepare for a lifetime of good dental check-ups. As the parent you are welcome to accompany your child into the treatment area.You are a vital member of our team. You know your child and what will work best for them. Depending on the situation, we may ask that you allow your child to accompany our staff through the dental experience. We are all highly experienced in helping children overcome anxiety. Separation anxiety is not uncommon in children, so please try not to be concerned if your child exhibits some negative behavior. This is normal and will soon diminish. Studies and experience have shown that most children over the age of 3 react more positively when permitted to experience the dental visit on their own and in an environment designed for children. Expect your child to do well and enjoy their visit to our office and chances are they will do just that! We make a concerted effort to make your visit as enjoyable as possible. Our goal is to provide a great appointment experience with outstanding service. Our doctors and staff maintain the highest standards in adolescent dental care. If you have any questions or concerns, please do not hesitate to ask us. Infants and Childrens: The beginning of a child’s dental care program is crucial. 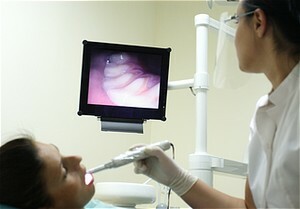 The foremost concern is establishing a program of preventive dental care. It is also important to get the facts about early childhood caries (also known as baby bottle syndrome), a risk for every child but one that can be prevented. Ask us about thumb, pacifier and bottle habits. We’ll provide you with a wealth of information about your child’s growth and development. Adolescence and Young Adults: There are many factors that make the pre-teen and teenage years an important stage for dental care. It is normal that self-esteem and confidence issues may arise and these are directly related to appearance and self-image. Our office takes these issues into consideration and we are extra sensitive to the needs of teenagers. Eating patterns may become slightly irregular and frequent snacking on unhealthy foods often becomes the norm. Drinking carbonated soft drinks regularly can contribute to the erosion of tooth enamel. 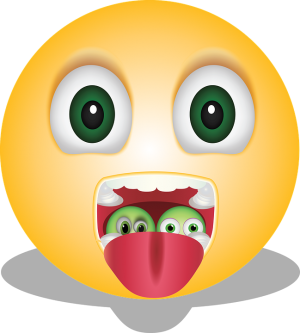 Soft drinks contain sticky sugars that bacteria in our mouths use as an energy source. They break these carbohydrates down into acids and adhere to tooth surfaces. Using a straw when drinking soda can help keep sugar away from teeth. Remind your child to rinse his or her mouth with water after meals, especially during school, in order to leave their teeth free of sugar and acid. Emergencies: If your child has an accident, please call our office as soon as possible. We will see your child immediately. If it is an after-hours emergency, an after hours number will be given on the answering machine. The first 60 minutes after an accident are the most critical to treatment of dental trauma. If a permanent tooth is knocked out, gently rinse, but do not scrub the tooth under water. Replace the tooth in the socket if possible. If it is impossible, place the tooth in a glass of milk or clean wet cloth and come to the office immediately. If the tooth is fractured, please bring in any pieces you can find. Birth to 6 Months:Even before their first tooth appears, infants should have their gums cleaned with gauze or an infant washcloth after feedings and at bedtime. Avoid putting your baby to bed with a bottle. Talk to our kid’s dentist about fluoride supplements. 6 to 12 Months: When a child’s first teeth begin to appear it is time to visit the children’s dentist for a check-up. Begin brushing with a soft-bristled brush after feedings and at bedtime. As a child begins to walk, be especially alert to potential dental injuries. 12 to 24 Months: Weaning from breast or bottle by 18 months of age is advised. We recommend visiting our adolescent dentist every 6 months for an exam and cleaning. A pea-sized portion of fluoride toothpaste may be used when a child is able to rinse. During this stage of development most primary teeth have erupted. It is very important for parents to be involved in their child’s dental hygiene routine. Establish a healthy diet, daily tooth brushing and flossing as well as regular dental visits. Steps taken now will help build a lifetime of good oral health habits, so help by supervising your child’s brushing and flossing. Use toothpaste with fluoride to prevent tooth decay and cure cavities in their early stages. Our dentist can advise parents of fluoride supplement sources if needed. It is essential for your child to receive an on-going oral health assessment by a kid’s dentist. Your child may need additional fluoride, sealants or dietary modifications. Regular visits will also help children stay cavity free by removing plaque build-up on the teeth. As Spokane children’s dental care specialists, our patients are our most important asset, and we strive to develop long-lasting, trusting relationships with all of our patients. Your referrals are welcome and appreciated.